After a short chase routine involving a tree trunk on a cliff, Elmer quits. He tears his contract with Warner apart and decides to enter a career of fishing only ‘and no more wabbits!’. When he rests at the riverside, Bugs enters his serene dream to create a nightmare. This involves e.g. nightmare paint, rendering Elmer in Adam’s costume, making a girl out of him, followed by wolves and a great fall, which typically ends the nightmare. At the end Elmer returns to the scene, reassembling the contract and ready for another routine with the tree. ‘The Big Snooze’ is one of those great cartoons that play with their characters as being real stars (others being the Mickey Mouse cartoon ‘Mickey’s Gala Premier’ (1933), the Donald Duck cartoon ‘The Autograph Hound‘ (1939) and ‘You Ought to Be in Pictures’ (1940, starring Porky and Daffy). The Big Snooze’ was to be Bob Clampett’s last cartoon at Warner Bros. He was fired before he could finish it, and the short was completed by Art Davis, who succeeded him as a director. 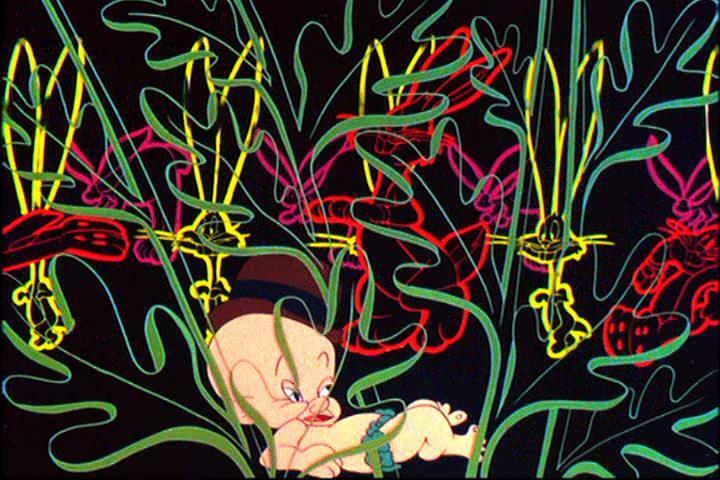 The film’s look and feel is still that of the war era, while contemporary cartoons by Chuck Jones and Friz Freleng show the studio was heading into other directions, with milder humor and more sophisticated designs. In contrast, in ‘The Big Snooze’ Clampett’s animation style is extremely flexible, as usual for him, and his backgrounds are as vague as ever. ‘The Big Snooze’ is a hilarious cartoon that marks the end of an era, where the wildest and the zaniest gags were possible. Only Tex Avery at MGM would continue the extreme style. Bob Clampett left Warner Bros. in May 1945 to join the Screen Gems studio. He was succeeded by Art Davis, who would direct some great cartoons until his unit was closed down in 1949. In the years following Clampett’s leave, his zany style was continued for a while by his master animator Robert McKimson, who had been promoted to director only a few months earlier. However, McKimson soon toned down both animation and humor, and he would never achieve the same level of originality as Bob Clampett did during his Warner Bros. days.